What am I doing, reading, or finding interesting? Follow me on Facebook or on my blog. Wide open spaces, prairies, fields of wheat or corn or sunflowers, broad horizons, calves gamboling beside their grazing mamas, and lazy sunsets over the mountains bring a smile to my face. Daily doses of sunshine lift my spirits and generate energy. These are like white space on a page. I collect word pictures and rocks. I love a good hamburger with yellow mustard. I listen to Tim McGraw, Exile, Alan Jackson, Diamond Rio, Alison Krause, Ronnie Milsap, the Oakridge Boys, Alabama, and Motown. I'd be happy to hike every weekend, and I've climbed two of Colorado's 14ner mountains (mountains over 14,000 feet.) I can't imagine living without a piece of land - see my Alaska Cabin. I once again have a dog to roam and explore the hills and prairies with me. Taffy, an English Cream, has achieved her Canine Good Citizen Basic and Advanced certifications, accomplished off-leash training, and met Pet Partners Therapy Dog qualifications. 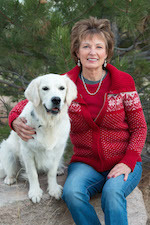 We are a therapy team at a nursing home, assisted care facility, and at the new PAWS program at our local hospital. We humans need a purpose-driven life — and I believe dogs are happier using their distinct breed-strengths as well. I have moved 23 times in my life and still become restless when I live anywhere too long. I identify with the little girl in the movie "Chocolat," who, whenever the "clever north wind blew," would be pulled by her mother to a new place. Just like that child, I hate moving. Just like mother and daughter, I've become adaptable. Baking cinnamon rolls and pies has brought continuity to my relocations, and helped me meet new neighbors and make friends. I've learned that when I use my natural bents and work alongside people with similar goals, I naturally build relationships, accomplish much, and have fun in the process! Trying a new writing style. My column in The Country Register amuses and challenges me with the restrictions of writing only 300 - 500 words per article. Current Project. It's time to write another book. My father, the bush doctor, hunter, cliffhanger adventurer, was always the hero. Now it's my mother's turn to tell her side of the story. "The Bush Doctor's Wife" will focus on my mother, Ruby Leppke Gaede, during our family's two years (1957 â€“ 1959) in Tanana, Alaska, a small Athabascan Indian village, along the Yukon River; a location in Alaska inaccessible by connecting roads or trains, and only by air when the weather is suitable, and by boat when the river is not frozen. My mother was an adventurer, not by choice, but by the roles and environment in which she found herself. The book will immerse the reader in remote village life, show Ruby's daily life (ordering food for a year, keeping a toddler from falling into the river, often cooking without fresh produce, baking several days a week, instigating a satisfying and often amusing social life), as well as bring the reader alongside Ruby to experience her longing for family, farm, and familiarities at her home place in Kansas. All four of my previous books took a pass through Tanana, but don't assume youâ€™ve heard all the stories. This book will include flashbacks of how my parents met in Kansas, their struggle to provide for basic needs through farming, and the incentive for my father to leave his traditional Mennonite farming roots and pursue medicine, which ultimately led to Alaska. I've carefully saved surprises and laughter for my faithful, and new, readers. My first serious writing efforts were for a church newsletter and then an inner city ministry. My first published material was a short Christmas reflection published in the December 1981 issue of "The Christian Leader." I was paid $25 — and felt like a real writer. My first book was Memories & Meals. In 1983, a group of us put together the recipes and history of Deer Creek Christian Camp, Bailey, Colorado. Word processing was just coming into existence. Typing and retyping was the mode of operation. The software "publisher" was unheard of. I placed every perfectly typed page on the floor around my living and dining room to figure out which page would be right and which one left. Today, Memories & Meals is the only history of the camp. I still have requests to purchase the book, of which there are no available copies for sale. If another collaborative effort were to be ignited, I'd be happy to work on that project. What launched me into bookwriting? My father hand-scribbled some of his flying, hunting, and medical adventures. I chose one and shaped it with a lead, setting, character description, tension, and dialog. Then I submitted it to Alaska Flying magazine. It was accepted. I chose, shaped, and submitted another. It was accepted. Why not branch out? 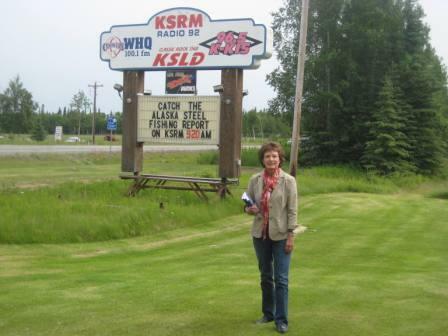 I sent his stories and some of my own articles to Fairbanks Daily News-Miner, The Christian Leader, Christian Medical Society, and other publications. They were accepted. 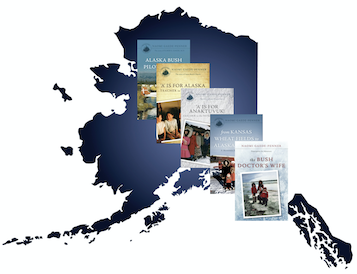 Having accumulated a handful of Alaska stories, I naively thought that writing a book wouldn't be much more difficult. I was inexperienced. I was enthusiastic. I was a hard worker. I was persistent. Writing a book is far more intense than writing an article. It requires seeing the entire project, conceptualizing how chapters will fit together, working with flashbacks to give the back story and to stall the climax, yet not losing the reader. Too much and too little detail needs to be weighed. The entire book needs to be balanced with the same amount of time allocated to elements in each chapter. Individual chapters have to be thoughtfully crafted within the carefully strategized book. In 1991, Rx (prescription) for Adventure: Bush Pilot Doctor was born. Since that time, it has been through four revisions and re-publications. It's definitely a fasten-your-seat-belt type book and readers keep buying it. To piece together a story from my parents' letters that were written starting in 1943. To sort out information that I find intriguing, but is not necessary for the story. To not over-repeat information, flashbacks, or stories among the books. To develop a strategy for the series. To put together a Critique Group that asks suitable clarifying questions, understand good writing technique and style, and offers options on slant or development of the story. Using your natural abilities and individual passions with the result of an adventure? Doing something outside your comfort zone? Exploring the unknown? Wilderness, mountain top, ocean, third-world country, inner city? Living in an environment conducive to adventures? Taking on physical feats with unknown outcome? Here are some of my adventures. 2001, "The Red Baron and the Flying Gator." 2001, "What Float Plane Passengers Need to Know." 2001, "First Snow: Brother Determines Start of Family Tradition." May 13, 2001, "You'll Find Her in the Garden." Dec 17, 2000, "Sun Worshippers." Under Search Author, type "Naomi Gaede Penner"
Mar 2000, "No Ordinary Day" (Excerpted from Prescription for Adventure: Bush Pilot Doctor), Selected for the Third Annual Central Peninsula Writer's Night. Apr 1989, "Flight by Faith," Moody Monthly. Spring 1989, "Bush-Pilot Doctor in the Last Frontier," Christian Medical Society. Nov 1987, "Learning to Fly...Can Open Unusual Doors," Alaska Flying. Feb 8, 1987, "Bush Doctor," "We, Alaskans." Fairbanks News-Miner. Feb 1987, "The Flying Physician: Rx for Excitement," Alaska Flying. Dec 1986, "No Ordinary Day," Alaska Flying.